The Queen and the Duke of Edinburgh will officially open an elephant centre at the Bedfordshire zoo. The region's newest city is to get a Royal visit next month. The Queen will be come to Chelmsford on Tuesday, May 6. It will be the first time the Queen has been to Chelmsford since it became a city. Buckingham Palace have yet to confirm details of her trip, but it is expected Her Majesty will visit Chelmsford Cathedral as part of it's centenary celebrations. Prince Philip will also be part of the Royal party. The University of Bedfordshire is due to be honoured by the Queen later today. The institution, which has campuses in Luton, Bedford and Milton Keynes, is to receive the Queen's anniversary Prize for Higher and Further Education at Buckingham Palace. The award will be presented to Vice Chancellor Bill Rammell. The award is for the University's research into helping shape child protection policy. The Queen delighted crowds in Norfolk today, when she opened Thornham Village Hall. The villagers had asked more in hope than expectation if Her Majesty would perform the ceremony. To their delight she said yes. Now when a group of villagers at Thornham in Norfolk decided they needed a VIP to open their new hall they got their heads together to think of someone suitable. Working on the principal that 'you don't win the raffle if you don't buy a ticket' they wrote to the Queen to see if she would agree to do it. 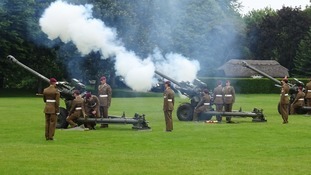 To their delight Her Majesty said yes and hundreds of people were on hand as she performed the opening ceremony today. The Queen pays her annual visit to the Women's Institute this afternoon. Every year during her Christmas holiday at Sandringham she meets members of the nearby West Newton branch of the WI. As well as Her Majesty, the event always has a surprise guest speaker who's identity is never revealed until just before the meeting starts. The Queen was greeted at King's Lynn train station today as she made her way to the Sandringham Estate for Christmas. 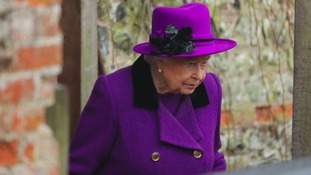 The Queen is in Norfolk to start her annual Christmas holiday at the Sandringham estate. 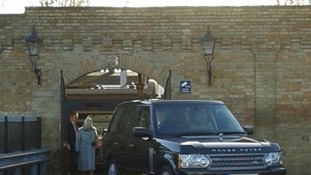 Her majesty arrived at King's Lynn's newly-refurbished station just after noon and was then taken to nearby Sandringham in a black Range Rover.